Infographics have become a significant part of a B2B marketing content arsenal in recent years. In fact from 2010 to 2012, infographic search volumes experienced more than an 800% increase and they haven’t slowed down. Should this statistic surprise us? With 90% of information transmitted to the brain being visual in nature, and visuals processed 60,000X faster in the brain than text, it shouldn’t. The infographic is an ideal way to target these visual learners. In addition to our visual nature to learning and grasping content, people are naturally drawn to facts and figures. We follow trends closely to be “in the know” and ensure that we continue to evolve with trends and importance influences relevant to our specific industry and job roles. 2. They offer a visual way to explain complex data and facts. Going back to my earlier series of statistics around visuals and how the brain processes them, infographics are more eye-catching than printed words since they usually combine images, colours and content that naturally draw the eye in. 3. They are ideal for our dwindling attention spans. I read recently that a goldfish has a better attention span that humans. With increasingly shorter attention spans, the population tends to scan material rather than reading text. Infographics can be consumed quickly and offer a lot of value add information. 4. They are highly shareable, linkable and boost SEO. One of the major promotional benefits of infographics is generating inbound links to your website. Their ability to be shared will generate static backlinks and social signals, which play an important role in Google’s “Page Rank” algorithm, which is important for organic SEO. 5. They will increase your social media presence. 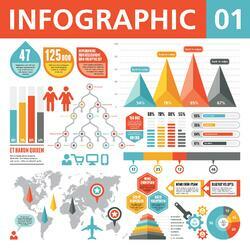 Infographics are popular social media tools for several reasons. People want information and they want it now. Social media is all about speed, and infographics communicate more information in a shorter amount of time. Infographics are filled with the kind of information we love to share. Social media is also highly visual today and infographics fit nicely into this dynamic and help break through the clutter of everyone else’s feeds. 6. Demonstrates an Expert Understanding of a Subject. The research needed to create a compelling infographic will help you display your brand’s knowledge. By publishing relevant and useful infographics that educate and offer insight, you position your brand as a thought leader on your topic or industry. 7. They are a great brand awareness tool. Infographics have exploded as a form of shareable content that has provided measurable results for B2B marketers, making them a must for any B2B marketing strategy. If you’d like to talk about how to incorporate infographics into your content calendar or how to leverage content you’ve already created into an infographic, contact us.